Gibson stated that when the Braveheart script arrived and was recommended by his agents, he rejected it outright because he thought he was too old to play the part. After careful thought, he decided to not only act in the film, but to direct it as well. Gibson received two Academy Awards, Best Director and Best Picture, for his 1995 direction of Braveheart. 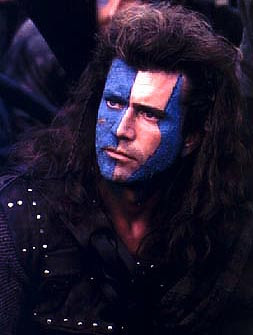 In the movie, Gibson starred as Sir William Wallace, a thirteenth-century Scottish freedom fighter. He said in interviews that he was attempting to make a film similar to the epics he had loved as a child, such as Stanley Kubrick's Spartacus and The Big Country. The filming began in the Scottish Highlands. After learning that the intended filming locations were among the rainiest spots in Europe, the shooting was moved to the Republic of Ireland, where members of the Irish Army Reserve worked as extras in the battle scenes.